Advertising Your Website is Easier and More Affordable Than Ever. Put us to work as your own personal advertising team. First and foremost, let's make sure we distinguish buying traffic and clicks from buying leads. Clicks (aka Traffic) - when you order Clicks you will receive a guaranteed number of website 'visitors' that are interested in starting a home business. These visitors may sign up on your webpage as a lead or contact you directly. Your website or presentation tool is the KEY factor in helping the prospect/visitor take the 'next step'. Buying clicks is best for those who have a presentation tool or marketing site that helps you deliver the company or team message. If you gather contact information from the prospect on your site, a follow-up call is recommended. Leads - when you order Leads you will receive a guaranteed number of prospects who've filled out a "make money from home" - lead capture page. If Leads are the best option for you click here to see our full menu. Working with us, you eliminate start-up costs, tracking platform expenses, creative services and the extensive learning curve of buying traffic or email marketing campaigns. You choose what you want the prospects to see! Visitors to your website will have the opportunity to view your sales message or watch your presentation video. Prospects who convert to leads or contact you directly through your marketing funnel are more educated on you and the company you represent. 12 years of advertising expertise at your fingertips. You don't need to know PPC. You don't need to manage traffic, set bids or develop ad groups. You don't need to manage keywords, advertisements, or anything else. 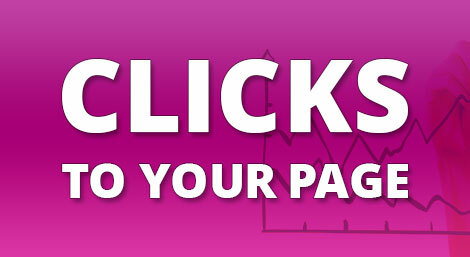 Simply select the number of clicks you would like to receive and we take care of the rest! Get started today! It's really that simple. In addition to our web based interface, you have the following options for receiving your Clicks.Please check the boxes next to your preferred method of delivery. More than one method of delivery may be selected.